Throughout the years, Miles Paddled has received thousands, literally, thousands, of comments. They mostly arrive via email or directly to the site, but also to Facebook, Twitter, Google, YouTube, Vimeo, Instagram, Messenger, and even snail mail (no kidding). They’ve come from friends, family, fans and strangers. Sometimes, in-person at events like Canoecopia or Rutabaga or REI, or while paddling on rivers and creeks, at campgrounds, landings, while shuttling, or even while standing on the shoulder of the road scouting at a bridge. We’ve received queries, quandries, observations, recommendations, reconsiderations and many thumbs ups, thumbs downs, hearts, smiley faces, haha faces, wow faces, sad faces, angry faces, retweets, regrams, +1s, mentions, etc. And a bunch of spam. So much spam. But even the spam wants to comment. We’ve had our fair share of unsavory, objectionable and obnoxious comments, as well as wonderful, constructive, insightful, intriguing, thought-provoking, thankful, grateful and stick-with-you-through-life kind of comments. Combined, they make a Lifetime movie of emotions. 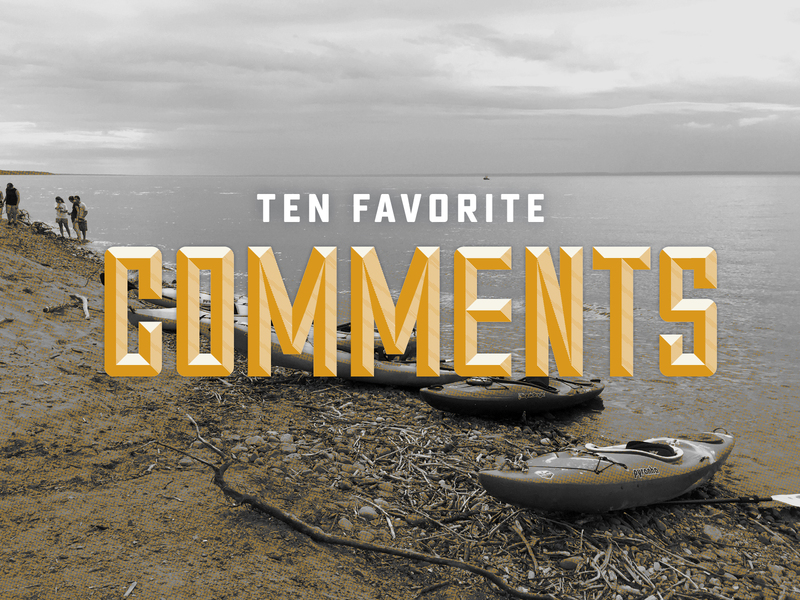 A large handful of those special ones are the comments that make up the heart of our 10 Favorite Comments list. And to all of you have sent us some sort of comment/signal, however/wherever at some point, I can’t thank you enough. I love the term “Holy Grail” to describe the site. I would hope to feel the same way if I came across it for the first time. I felt this way about Svob’s books, and then after discovering Tom Lindblade’s videos, and later Mark and Mary Morrall’s too. They were my inspirations to not only paddle, but document as well. I love that even when warned, someone else still gave it a go. We’ve been there, and will no doubt (because we’re stubborn mules) be in those same shoes/Chacos again. And here lies the only all-pirate-speak comment I’ve received. A participation award was instantly granted, but damn if that didn’t also earn these kids a couple stickers. Inspiring others to get out on the water? Damn – that is what we hope to do. And if we can be a one-stop-shop for a day paddle, well, then there’s something to be said for convenience. “Good evening, my girlfriend found your website when we were considering doing some paddling on the Milwaukee River, and we ended up doing a section that you had covered. Then, I was up north of Black River Falls about 3 weeks ago for a vacation. I ended up using the second half of the week to do some kayaking that I’d planned using milespaddled. I stayed at the East Fork campground and paddled the East Fork, the Black from Hatfield to Halls, and Robinson. I also took a look at Halls and Wedges, which appeared to be too low. I had never done any river paddling before and I had a blast doing them. It was so reassuring to have the knowledge, the photos, the videos, the maps, and the links to the flow gauges! The site is written and designed well and overall is just a really remarkable resource. It went so well, in fact, that I took another 3 days off last week and went back up there with my best friend, where we covered the Black from the powerhouse to Halls, Halls itself, Wedges, and Robinson, then went north to the Yellow and Jump. We couldn’t quite work up the nerve to do Little Falls on Jump, it looked to be just beyond us and we didn’t want to ruin a great trip somehow. This entire email makes me happy. It touches on everything special that’s the result of crafting this blog. And it’s the first time that anybody has ever asked to contribute, which was beyond generous and touching. I’ve said it before and I’ll say it again; imitation is the biggest form of flattery. While digging through comments, emails and messages, I found three messages from people that credited Miles Paddled for inspiring their own trip documenting and blogging. It’s pretty damn cool to think we’ve made an impression, and that we helped inspire others to make things. Things like we’re making. Blogs like we’re making. If we’ve helped inspire someone’s weekend, their day, an hour of their day, or damn, an entire hobby? Well, that’s as cool as it gets. I love that we’ve helped others find rivers and creeks just outside their own back door. And I also love every visit I’ve had to this cafe. And expand we have. Here’s the first email that created a collaboration between Timothy and Miles Paddled for eight years and counting. “Didn’t get drowned” makes me laugh every time I read it. However, this email has given me (very real) pause every time I’ve read it because she brings up a valid consequence of said blog. If the blog suddenly stops – I might have died. Who would know? I mean, wouldn’t that be ironic? Via Facebook Business Review, 2017. This might, just might, be my favorite comment ever, but I can’t decide which part of it I love more. Both, the “some I’ve never contemplated” or the “You do you and you do it well” are pretty amazing. And I would like to believe, accurate.